Several blogs and news reports have criticized the cost of the program as too expensive for relatively long bike trips (more than 45 minutes). But the program is really designed primarily for the “first and last mile” of local commutes and tourist trips to and from their destinations. Now that the city’s map is out, we can evaluate how likely it is that the locations will meet this goal. Last year I examined the thousands of bike share kiosks suggested by “the crowd” to see how closely they were located to subway entrances. I determined that, as of late September 2011 based on almost 6,000 suggestions, one-third of the suggested sites were within 500 feet (actually, if I had used 750 feet — the average distance between avenues in Manhattan — it would’ve been 45% of the suggested sites located that distance or closer to a subway entrance). You can still see the crowdsourced locations here. So about half of “the crowd’s” suggestions were close to public transit, and the other half further away. That seems reasonable — perhaps half the suggesters were thinking of how to link bike share with the subway system, and the other half was thinking about linking bike share to destination sites further away from mass transit. I had suggested this as a way of prioritizing the bikeshare station siting process. These subway entrances are the ones you’d likely start with, based on the preferences of the (bike)riding public who contributed to the DOT/OpenPlans map. But now that the bikeshare station siting process is pretty much done, I’ve examined whether the proposed kiosks are close enough to subway and bus stops to actually facilitate their use by the intended audiences. How do the actual proposed locations measure up? For me, the city’s proposed bike share program is a great deal — if the kiosks are near my home and my office. I live on Manhattan’s west side and work in midtown. Since I live near my office I’m lucky to have a pretty easy commute. But usually that involves a good amount of walking: my trip uptown is just one subway stop, and then going crosstown involves either a bus (luckily the M34 Select Bus is pretty reliable) or a schlep walk of several avenues. Don’t get me wrong — walking is great exercise. But if I could shorten the walk and save money, I’m all in. According to DOT’s map [PDF], there’s a bike share kiosk proposed down the block from my apartment, and another one a block from my office. Nice! I could actually replace the subway/bus combo with a bike ride for a fraction of the cost. But what about the rest of the Phase 1 area? 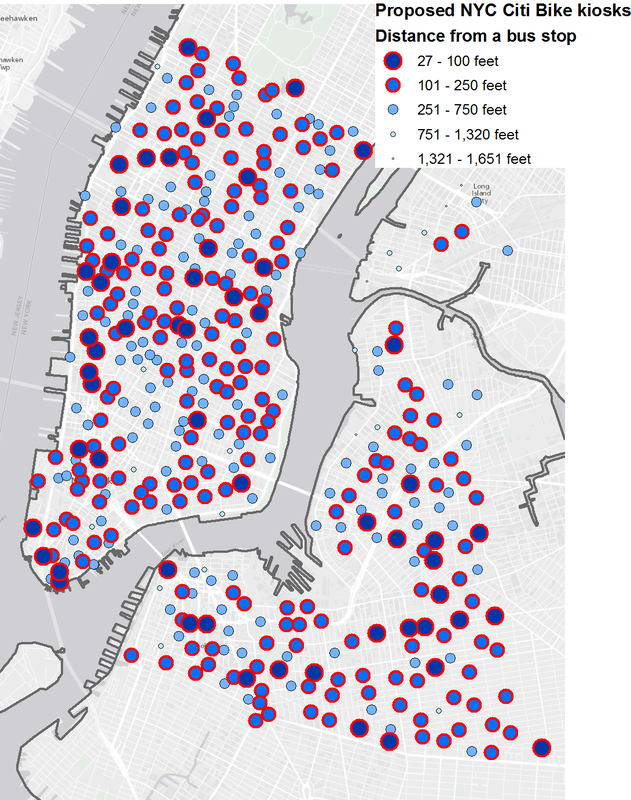 Are the kiosk locations designed to easily extend subway and bus trips for the “last mile”? Here’s what I found: most of the proposed bikeshare locations are relatively close to subway entrances, and even more are closer to bus stops. At least regarding the locations, the system seems right on track to meet its goals of facilitating New York’s commuter and tourist trips. 21 kiosks (5%) further than 2,640 feet. The proposed kiosk closest to a subway entrance is in lower Manhattan, on the west side of Greenwich St near Rector St (ID 12364), 14 feet from the Rector St entrance to the 1 train. The kiosk furthest from a subway entrance is on Manhattan’s west side, in the Hudson River Greenway near West 40th Street (at the West Midtown Ferry Terminal; ID 12092), almost three-quarters of a mile (3,742 feet) from the 40th St entrance to the 42nd St/Port Authority Bus Terminal station. In other words, half of the proposed kiosks are within an avenue of a subway entrance, one-quarter are within two avenues, and the rest are further away. So I guess it depends on your level of optimism (glass half full or half empty), and/or how far you’re willing to walk between your destination and a bike rack to participate in the Citi Bike program. But in general it seems that the proposed kiosks match the overall location patterns of the crowdsourced suggestions, and also support the goal of facilitating first/last mile transportation. So for bus riders, almost two-thirds of the proposed kiosks are within a block of a bus stop, and almost all of them (95%) are within an avenue. Pretty good odds that bus riders will have extremely convenient access to the Citi Bike program. I was skeptical of the program at first (and I’m still a bit wary of so many more bikes on the road all of a sudden — I walk in fear when I cross a city street, because of cars and bikes). But now that the Citi Bike program is moving closer to reality and the numbers look so good, I’m looking forward to trying it out. Don’t the first mile/last mile users need to have (half of the) kiosks located further AWAY from subway/bus stops? The benefit of the bike is realized when their ultimate destination (office, home, store) is not near a subway or bus stop – the point is they NEED the bike to take them the last leg of their trip – and accordingly they need to have a place to dock the bike when they get there! If most of the kiosks were near subway/bus stops, then the user would just stay on the subway/bus until that stop. Thanks for your comment. I agree, though I don’t think the split between near/far has to be exactly half. Indeed, the stats in my post show that between half and three-quarters of the bike stations are close to subway entrances (depending how you define close), and the rest are further away. 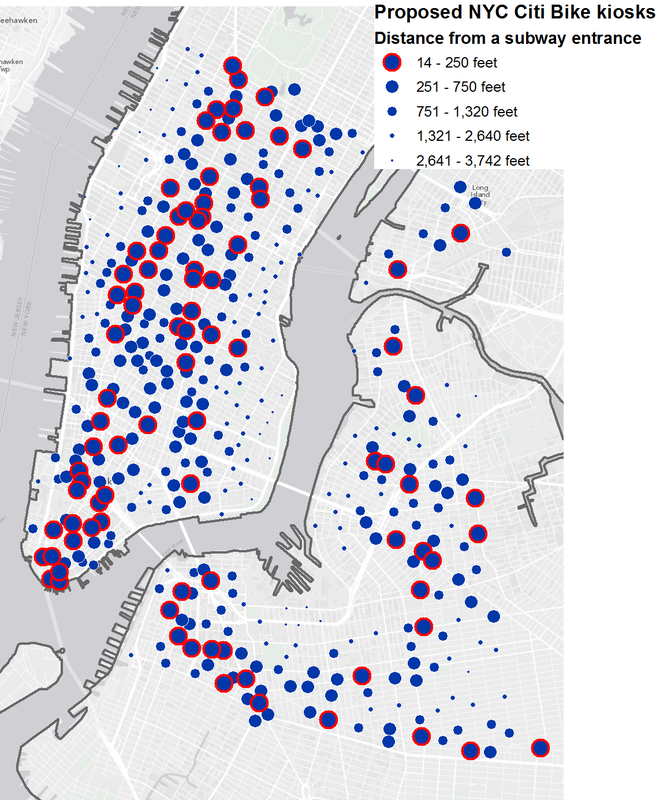 As I note, this roughly matches what had been suggested to DOT via their online suggestion map, and seems to be a good distribution of kiosks to both extend the subway system and to facilitate short trips by bike. Also, as someone pointed out in a comment at Streetsblog, some of the farther away bikeshare sites are actually close to other transit options such as ferries. Perhaps DOT could shed some light on the details of their siting decisions. The map was the result of an extensive public input process (one which i think is a great model for other city agencies to follow). It’d be interesting to learn more about why certain locations were picked over others. There may be very good – but perhaps not obvious – reasons for some of the siting choices. Hopefully we’ll learn more as the process continues. That’s a good point, but consider that not every bus stops at every bus stop. Bike share can help condense a multiple-bus trip into a single bike ride. 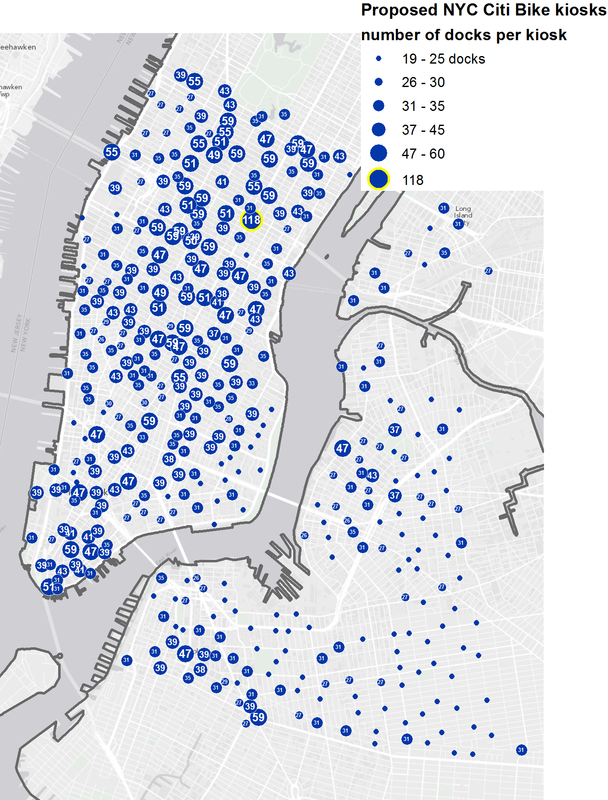 Also, one way to think about the data as presented is that bus stops in particular are good proxy points for activity. There’s a bus stop near most homes and job sites; it may not be the bus that’s near your home or office, but there’s usually a bus stop there. Siting the bike share kiosks near bus stops takes advantage of that latent demand.